Original Antique Maps and Prints. Description: This old antique engraved map originates from a rare 2 volume Hondius / Janssonius Atlas:’Atlas, das ist, Abbildung der Gantzen Welt…. , published in 1636 in Amsterdam containing maps by Gerard Mercator, Jodocus and Hendricus Hondius and Johannes Janssonius. (ref: Koeman 1:322). We carry most maps from the 2nd volume: France, Spain, Portugal, Greece, Mid-East, Asia and America. One can find many references in online literature to these famous icons of cartography. Iehan Iubrien Chalonnois is indicated on this map as the maker. Subject: Title:’Le Duche D Aniou, Amstelodami 1630′ (Anjou). 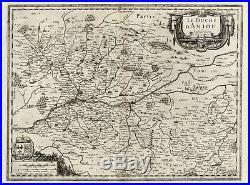 This maps shows the cities of: Segre, Angiers, Samur, Poitiers and others. At your request we can have this map further flattened (no cost) or coloured by professional antique map / print colourer (cost inquire). Size (in cm): The overall size is ca. 56 x 46 cm. The image size is ca. 49.5 x 37.5 cm. Size (in inch): The overall size is ca. 22 x 18.1 inch. 19.5 x 14.8 inch. Medium: Engraving on verge type hand laid paper with watermark. We absolutely guarantee the authenticity of this item. ThePrintsCollector – Laurentius Old Master Prints Frans Laurentius, Peter Cornelissen Margo van Latum-van Dongen, Frank van Latum Located in Zeeland (Noord-Brabant) – The Netherlands. GO TO OUR STORE and explore our huge collection of fine antique maps and prints. Combined orders are possible! The item “Antique Map-FRANCE-ANJOU-Hondius-Janssonius-1636″ is in sale since Friday, October 2, 2015. This item is in the category “Antiques\Maps, Atlases & Globes\Europe Maps”. The seller is “theprintscollector” and is located in Zeeland. This item can be shipped worldwide.